Predicts large vessel occlusion (LVO) in patients with acute stroke. Use in the prehospital setting (i.e., by EMS providers) in patients with stroke symptoms. The RACE Scale for Stroke is based on the well-known NIH Stroke Scale assessment and predicts stroke caused by large vessel occlusion (LVO). Provides quicker assessment than NIHSS for use in the prehospital environment to help predict LVO. While there are 11 points on the scale itself, the assessment is done based on the side of the patient’s neurologic deficits, so it is important to remember that the maximum score is 9. Depending on the patient’s deficits, testing is done for either aphasia or agnosia, not both. While not as comprehensive as the NIHSS assessment, the RACE Scale is a much more rapid tool that still retains sensitivity for severe strokes. Several other well-known prehospital stroke scales exist, such as the Cincinnati Prehospital Stroke Scale (CPSS) and the Los Angeles Prehospital Stroke Screen (LAPSS), but they are all qualitative scales designed to rule in or rule out a stroke. The RACE Scale is the first major quantitative assessment to help predict LVO and thus identify which patients may be best served at a Comprehensive Stroke Center. Data show that patients with LVO have better outcomes at Comprehensive Stroke Centers with endovascular options such as mechanical thrombectomy. Not all stroke patients fit into this category. A sensitive, predictive tool for LVOs that provides a quantitative stroke assessment helps prehospital providers and medical control plan for faster, better care of stroke patients coming via EMS. For patients with RACE Scale scores ≥5, an LVO should be considered as the cause and a plan put in place to get them definitive care at a Comprehensive Stroke Center as quickly as possible. For patients with a RACE Scale scores ≤4, an acute stroke should still be considered. However, as lower score correlates with lower NIHSS score, these patients may not be candidates for invasive therapies. Consider consultation with a neurologist, early CT imaging (non-contrast and CT angiography), blood pressure and blood glucose control. Consider tPA after an assessment of contraindications and possible transfer to a Comprehensive Stroke Center if indicated. The RACE Scale is not a substitute for a full neurologic exam and NIHSS assessment in the ED. Emergency physicians and hospital personnel should still think of and try to exclude other causes of neurologic deficits such as intracerebral hemorrhage (ICH), hypoglycemia, Todd’s paralysis, complex migraines, exacerbation of prior deficits from a new metabolic source, etc. Early imaging and consultation with a neurologist are important. If the neurologic deficit is deemed to be from an ischemic event, then IV thrombolysis should be considered and definitive care at a Comprehensive Stroke Center should be considered. RACE Scale scores ≥5 were found to have the best predictive value and while protocols vary, it is generally recommended that patients with scores ≥5 are directly referred to a stroke center with endovascular capabilities. The RACE Scale was initially designed and validated for prehospital use by Pérez de la Ossa et al in Catalonia, Spain. The initial design was based on a retrospective cohort of 654 patients with an acute ischemic stroke. The scale was modeled after NIHSS values with a higher predictive value to include facial palsy, arm/leg motor function, gaze, and either aphasia or agnosia depending on the hemisphere involved. Once the scale was created, a prospective validation ensued. EMTs were trained in the use of the scale and 357 patients were enrolled. Stroke severity was assessed at admission and imaging modalities were used to determine the presence or absence of LVO. An LVO was found in 76 of 357 (21%) of these patients. ROC curve analysis showed a similar capacity to predict an LVO as compared to the NIHSS. A RACE Scale value of ≥5 showed a sensitivity of 0.85, a specificity of 0.68, a positive predictive value of 0.42, and a negative predictive value of 0.94 for detecting an LVO. A second study was designed to assess whether or not bypassing patients with a RACE Scale ≥5 to a Comprehensive Stroke Center would improve outcomes. In Toledo, Ohio, EMS personnel were trained in the use of the RACE Scale. Over a 6 month period, patients with a RACE Scale ≥5 were bypassed to a Comprehensive Stroke Center as a RACE Alert (RA). Outcomes including time efficiency, diagnostic accuracy, and mechanical thrombectomy outcomes were measured. 109 patients were bypassed in the 6 month study window. These outcomes were compared to 142 standard “stroke-alert” patients in the preceding 6 months. The results of this study showed an increased treatment rate, improved door-to-CT times, and improved door-to-needle times. The rate of mechanical thrombectomy also increased with improved arrival-to-puncture and arrival-to-recanalization times as well. Diagnostic specificity for an ischemic insult and as well as a non-significant trend of improved outcomes were both seen in the RA cohort. Pérez de la Ossa N, Carrera D, Gorchs M, et al. Design and validation of a prehospital stroke scale to predict large arterial occlusion: the rapid arterial occlusion evaluation scale. Stroke. 2014;45(1):87-91. Why did you develop the RACE Scale? Was there a particular clinical experience or patient encounter that inspired you to create this tool for clinicians and/or prehospital providers? Our experience in endovascular treatment from 2007 showed us that many patients, especially those transferred from remote centers, were frequently excluded because they arrived too late to benefit from revascularization therapies. After presenting a study at the European Stroke Conference analyzing the capacity of the NIHSS to predict large vessel occlusion, we had the idea of creating a shorter scale based on the items of the NIHSS with a stronger relation with large vessel occlusion (LVO), a simple scale that could be used at a prehospital level, with the aim of establishing in the future direct transfer models to accelerate access to endovascular treatment. During the next years, while our group was participating in the REVASCAT trial to demonstrate the benefit of endovascular treatment, simultaneously we worked on the development, validation and implementation of the RACE Scale in our region. What pearls, pitfalls and/or tips do you have for users of the RACE Scale? Are there cases when it has been applied, interpreted, or used inappropriately? The RACE Scale has a very high correlation with the NIHSS. In comparison with other simpler scales that include fewer items and simpler grading systems as present/absent instead of 0-1-2, the RACE shows a higher sensitivity and specificity. Simplifying the grading system of the RACE items reduces its predictive capacity (Carrera D, J Stroke Cerebrovasc Dis 2017). The RACE Scale includes 5 items (facial, arm, leg, gaze-eye deviation, aphasia-agnosia). Users must remember that for the last item, only aphasia or agnosia must be evaluated, depending on the body side affected. Note that some patients may suffer only from aphasia with no motor impairment, and in this cases only the last item should be evaluated. It's important to remember for arm and motor function: if the examiner observes a drop during 10 seconds (for the arm) or 5 seconds (for the leg) but without touching the bed or the surface, a 0 must be scored (even if there is an impairment! ); score 1 if the patient can raise the arm or leg but touches the bed in 10 or 5 seconds, respectively; score 2 if the patient cannot raise the arm or leg and drops it immediately (complete hemiplegia). Importantly, remember that the RACE Scale was developed as a severity grading system for stroke patients, but NOT for the diagnosis of stroke. Thus, some stroke patients can have a RACE score of 0, which means that there is a suspicion of an acute stroke with mild clinical impairment. What recommendations do you have for providers once they have applied the RACE Scale score? Are there any adjustments or updates you would make to the score given recent changes in medicine? The higher the RACE score, the higher the probability of having a large vessel occlusion. A cut-off point of RACE >4 allows detecting 80% of patients with a large vessel occlusion. However, we have to assume that about 25% of patients above this score will have a hemorrhagic stroke and 5% a mimic stroke. Adding some other clinical data as nausea/vomiting, headache or high blood pressure levels could improve the RACE Scale specificity to identify large vessel occlusion by ruling out hemorrhagic stroke patients. Whether these patients identified on the field should be transferred to an endovascular facility is currently under study (in the RACECAT trial). Designing the optimal delivery system must be considered accordingly with local resources and geographical constraints. You mention in the Discussion that 60% of patients transferred by EMS did not have a RACE Scale evaluated, and that those excluded had less severe strokes and less frequency of LVO. What implications does this have for your results? In the validation study, the RACE was evaluated in 60% of the stroke code activations transferred by EMS. Nowadays, after training EMS professionals with a 4-hour online course, the RACE Scale is implemented in the entire region of Catalonia (7.5 million inhabitants), and compliance of the RACE scale is around 80%. A revalidation study including more than 900 patients in Catalonia shows similar results, with a sensitivity of 81% and specificity of 63% for the identification of large vessel occlusion. Given that half of the patients were diagnosed with an LVO via transcranial doppler, do you have any thoughts on generalizability of this study to centers that do not use this modality? The predictive value of the RACE scale has been revalidated after its implementation in Catalonia with more than 900 patients, most of them studied with angioTAC [CT angiogram], showing similar predictive value. Moreover, in the validation study only proximal occlusions, that are easily detected with transcranial doppler, were considered as LVO. Thus, in my opinion, these results are generalizable to other regions. Why are posterior circulation strokes not considered an LVO? In fact, basilar occlusions are underrepresented both in the validation study and the revalidation study performed after its implementation in Catalonia, representing less than 10% of the sample. It's important to highlight that all of the patients with basilar occlusion had RACE scores higher than 5, so a RACE >4 may be also useful to identify basilar occlusions. Is a bypass model appropriate in a rural setting when a longer transport time may delay IV thrombolysis but allow initial point of contact to be at a center with endovascular capability? There is uncertainty about the equipoise between “drip and ship” (that prioritizes early IV thrombolysis and other standard-of-care therapies) and “mother-ship” (that prioritizes early endovascular thrombectomy) models. Data based on randomized controlled trials are needed. The ongoing RACECAT trial (ClinicalTrials.gov NCT02795962) aims to evaluate if direct transfer of acute ischemic stroke patients with RACE >4 to an endovascular center, bypassing local stroke centers, compared to transfer to the closest local stroke center is safe and offers a better clinical outcome. In the absence of evidence, current guidelines recommend that for patients considered eligible for IV thrombolysis in the field, if estimated transfer time to the nearest primary stroke center is considerably shorter than time to a comprehensive stroke center (approximately more than 30–45 min), the drip and ship model should be considered (ESOC-Karolinska Stroke Update 2016). 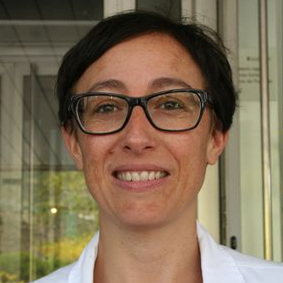 Natalia Pérez de la Ossa, MD, PhD, is a neurologist and researcher at the Germans Trias Hospital in Catalonia. Among her main research topics of interest are diagnosis through multimodal neuroimaging and neurosonology, treatment of stroke in the acute phase, and prehospital organization in the treatment of stroke.